Today marks the 250th anniversary of the birthday of Robert Burns. 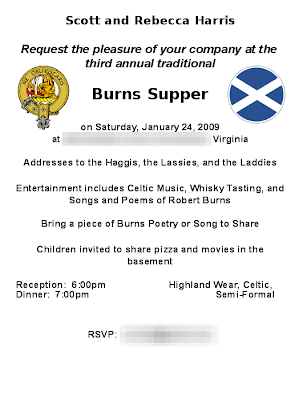 The national poet of Scotland is honored this time each year, at home and abroad, with the great tradition of the Burns Supper. This was our third year hosting the supper, and we were grateful to have our usual circle of Celtic (and Celtic-loving) friends to help us celebrate. Becky once again came through with a delicious dinner of roasted lamb, neeps and tatties, with a fresh green salad, and haggis, of course! I was responsible for making the haggis, and in trying to keep it warm in the oven, I chose a poorly-sized dish underneath it. The dish was much too small, and the spurting grease from the haggis caused a small fire in the oven. Becky was outraged until I stooped down to blow out the fire (and flashed Sharon from under my kilt). The smoke from the fire filled the house with smoke, and I lamely explained that I was trying to simulate a real peat fire for the effect. It was going to be a fun night! Not even thirty minutes into the party, and we'd already had a fire and flashing. We toasted our new president with a rousing chorus of "There's No One as Irish as Barack Obama". Sure, what's Ireland got to do with Scotland, you say? We take a few liberties in our Burns celebration, reaching across the Irish Sea occasionally for inspiration. © Copyright 2009, Leslie Emery. All Rights Reserved! A toast to the laddies -- no cause for alarm. Our laddies were steadfast and stable, and so full of good cheer. Whether we supported Ron Paul or Obama or even Hillary Clinton. Over dinners and campfires with this close-knit group and one telephoto lens. Whether with plumbing or car repair before their wives yelp. Ere running or cycling or swimming while they're off in their suits. 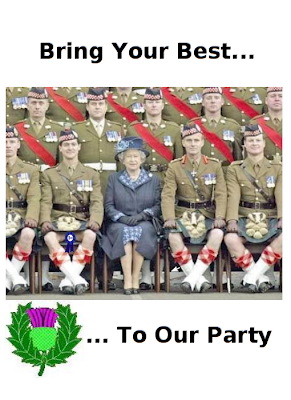 How we adore our laddies, so we treat them like kings. To the men that I toast, I dare not to roast them about their many attributes. In '08 I vacationed with you all, saw your contributions both great and small and grew to appreciate how unique each one of you are. That the turtle eventually beat the hare. Scott Emery, though not here, is adventurous but still full of fear. Sliding down slopes and climbing up ropes. His wife never sheds a tear at his mountains of gear, 'cause he knows that she's the best gear that he's got. Scott Harris, my brother, from a conservative FoxTV loving mother. Truly inspired and always too tired. He is ready for any trip or adventure, being thirty-something is our strength with these old folks we outrank, our youth and exuberance inspire them. Scott is early to bed and early to rise, Wifi his tool informing the wise. Nothing's too trivial to report. Though he missed my New Years party, I did not think him too foolhardy, his claims to be too tired were completely uninspired. I know that truth be told he is OK to be on the outside of gold and silver is he. Then there's Desi, sweet Desi, who has taught us to cope for a whole week without soap. Relaxed and refined, he mumbles and he cleans, keeping us relaxed and at ease. After these brilliant toasts, we moved into poems, jokes, and songs. Pam told us a nice poem on the nature of friendship, which strikes right to the heart of these parties. For everything I believe in! Two men are at the bar drinking, when one man says to the other, "You know, I grew up in this town?" "Really?!" exclaimed the other man, "I grew up here too!" So they toast each other and drink. Then the first man says, "Yup, I was born here, in 1964." "No kidding?" says the other, "Me too! What a coincidence!" And they toast each other and drink. "I went to St. Mary's school on that hill over there. Graduated in 1979." "You have got to be joking!" says the second man. "Me too! What a small world!" And they toast each other and drink. At this point, the bartender grabs a waiter and says, "You see, the MacDonald twins are drunk again." MacDonald was poor in health. He asked his friend MacDougal if he would pour a bottle of scotch over his grave if he should die one of these days. MacDougal said, "Sure'n I'll be glad, laddie, but would you mind if I passed it through my kidneys first?" 1. St. Andrew is the patron saint of Scotland and which other three countries? 2. 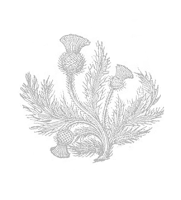 What is the name of Scotland's national poet? 3. What is the name of the Scottish flag? 4. How many Scottish islands are there? 5. What connects Sherlock Holmes to Scotland? 6. What are the three officially recognized languages of Scotland? 7. What is the population of Scotland? 8. How many people worldwide call Scotland their ancestral home? 9. Which Scottish location did Dan Brown's 'The Da Vinci Code' make even more famous? 10. On which Scottish island did George Orwell write his novel '1984'? Both Olivia and Madeline recited some Robert Frost poetry from memory--they were very pretty reciting the lines together, like only twins could do. And then, there was much music. Desi brought his guitar, and he and Sharon serenaded us with "Sally Gardens" and "Falling Slowly" (from the movie Once). I tried "Danny Boy" on my clarinet and vocally. (I think I pulled off the vocals, though the clarinet sounded like I was taking liberties with a goose.) Eoin played a couple of jigs on his fiddle, and Eddie played a couple of his pieces on the piano. We sang and sang and sang some more. We sang the "Wild Colonial Boy" and a few other tunes. Summing up, it was a magnificent evening. Thank you to all my friends for such a fun time. Hey! Sounds like a great party. In my beginner's piano book "The Campbells are Coming" is included. I've been playing it lately for some reason - and obviously now I know why. Burns was somewhere in the back of my mind. It sounds like you all had your usual funtime. It's nice that the kids were included in the festivities. Gabbi's poetry was incredible! I loved Maura's joke about the MacDonald twins. Thank you Sharon for the mention of my being a conservative FOX News watcher. Truth be told I am conservative & proud of it. As far as Fox New's goes - I only watch it around noon when the soaps are on & I watch Greta most evenings. Your father is the one who watches it 24/7!